The iPad is going 3D. And you can take that to the bank. It's just a matter of time - and it could happen sooner than you might think. As an army of rival tablets bear down on Apple's golden child, 3D is increasingly looking like its best next step. The internet began buzzing with speculation about the iPad 3 even before Apple closed the doors on the iPad 2 press launch. With Jobs & Co understandably keeping mum on what's to come, the rumour mill has run amok ever since. So we'd thought we'd add some conjecture of our own. Read on and we'll argue why the time is right to make the iPad 3D, how the display tech might work, and recap what's Apple's principal rivals are already doing in 3D space. 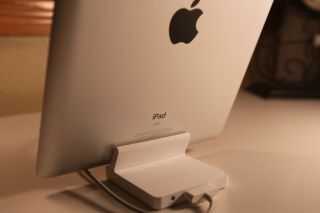 Speculation about the iPad 3 principally focuses on its display - and with good reason. It's the most obvious upgrade Apple can make to its tablet. Currently, the iPad 2 has a 1024x768 resolution screen. But Apple can do better. The Retina Display used by the iPhone 4 has no obvious dot structure and offers crystal clear text. That's because its pixels are just 78 micrometres wide. This so-called Retina Display has given Apple a visible advantage in the mobile phone market and it could well do the same in the increasingly congested tablet arena. Bringing Retina Display technology to the iPad would quadruple its resolution. Hints of a 1536 x 2048 pixel standard are already beginning to emerge, with Apple's Newstand app supporting both 1024 x768 and 1536 x 2048 resolutions. But even a Retina Display isn't a big enough deal to keep the iPad 3 ahead of the competition. It's common knowledge that world's biggest screen manufacturers are fast-tracking autostereoscopic 3D technologies. They see 3D as a driver both for hardware sales and content, but all know full well that consumers would rather not wear 3D goggles if they don't have to. Unfortunately producing large screen auto-3D is difficult. Every plane of depth you create robs the screen of resolution. To bring out a large no-glasses display you have to use a next generation 4K2K panel - that's 8 million pixels give or take. Today's 1920 x 1080 Full HD screens are 2 million pixels. So to produce a no-glasses 3D panel requires four times the resolution as a flat picture - which is exactly the same PPI bump that Apple's 78 micrometers pixel technology allows. Could this technique be used give the iPad no-glasses 3D? The numbers seem to add up. Adding fuel to the three dimensional fire was a demonstration by panel maker CPT (Chunghwa Picture Tubes) at the recent Display Taiwan show (which ran June 14 - 16). On its booth CPT was showing a 3D touchscreen display shoehorned into an iPad case. The display was not autostereoscopic; you had to wear passive 3D glasses to see the demo still images. CPT was saying nothing about the exhibit, but given how cool the end result looked we like to think it's a clear indicator of things to come. So what are Apple's rivals doing? LG has already shown its first 3D tablet. The Optimus Pad has an 8.9 inch 15:9 display, with 1280 x 768 resolution. Unlike the Optimus smartphone, it's not autostereoscopic - it requires you to wear 3D spex. Still, the advantages of its 3D functionality are clear. The Optimus pad, which runs the Android 3.0 Honeycomb OS, has dual 5MP cameras for 3D photography and camcorder stereoscopy. 3D footage can be viewed on the tablet or squirted out to a 3D TV.